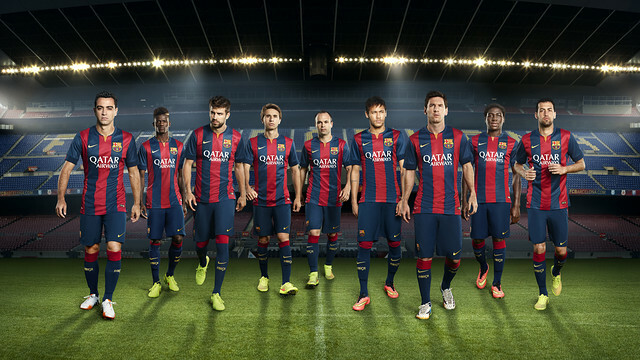 The new FC Barcelona 2014/15 kits will be available for purchase starting on May 22. They will also be available on nike.com on May 21. They will ba available worldwide starting July 17. Nike and FC Barcelona today unveiled the new home kit for season 2014-15 season, with stars from the present first team and the future of the club uniting as the side look to the future. From the famous La Masia to the iconic Camp Nou, FC Barcelona’s footballers are synonymous for a unique playing style and philosophy for nurturing young talent to craft victory on the pitch. As the team look to next season and future successes, FC Barcelona B-team players Sergi Samper, Edgar Ié and Jean Marie Dongou Tsafack joined established first team members to unveil the new kit. 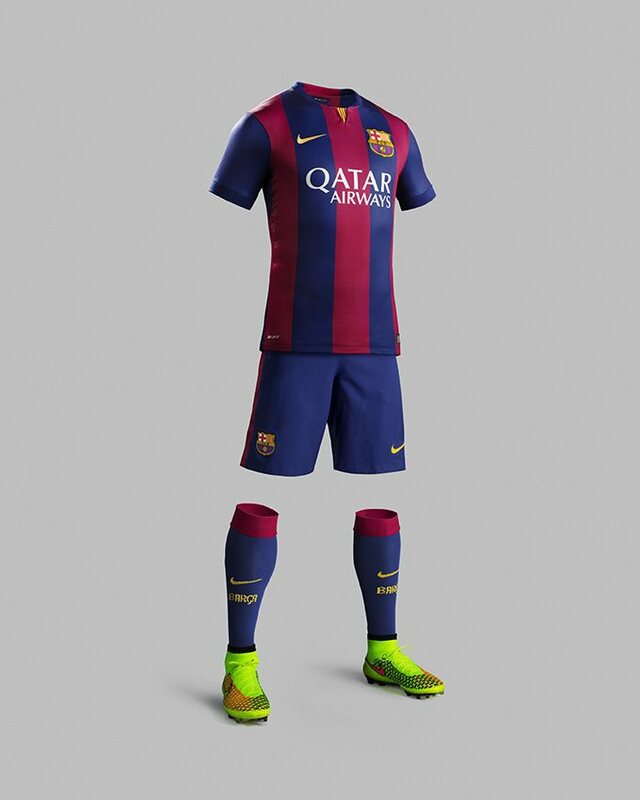 The home kit celebrates the return of the original Blaugrana for the 2014-15 season with a bold and classic look. This distinct new design provides Barcelona fans with their most authentic and truest identity of the modern era. The home shirt features the characteristic Barcelona stripes, which are bolder and wider and with a darker tone of red and blue. It also includes a renovated and spectacular crest, and a unique relaxed blue collar with a Catalan touch, as it showcases the Senyera flag in the open v-neck –the first time the Catalan flag has appeared on the front of the club’s shirt. Inside the back of the neck is a blue pennant tab with Barcelona’s inspirational club motto: ‘Més que un club’ (More than a club) and their foundation year of 1899. On the back of the neck is ‘Barça’ in the yellow from the Senyera and the Club’s unique font. The new home shorts are blue with a thin red stripe along each side, while the new home socks are blue with a red band at the top and a wide red stripe of chevrons on the back. While this new kit features Nike’s signature design details, it also offers players the very latest in performance innovation, kit technology and environmental sustainability.